This bread is simply wonderful and fun to eat. I made it two days ago and it was done just in time for our afternoon coffee/tea. But since it was too big for just two, Armin and I had the rest as dessert at dinner and then for breakfast the next day. And when my sister came over for a chat with her three boys (hubby included), they were still able to get to sample some pieces for a snack. It was really good and I love that it is so versatile. It would have been gone a lot sooner had we not tried (really hard) stopping ourselves from eating it all in a day. We would probably have done so too at one go but it is also really filling. This is my first time to make (and eat) this pastry, but since one of our readers requested for a monkey bread recipe (like ages ago). So if you read this Jemaima, then here it is at last. I know it took a while but here it is. 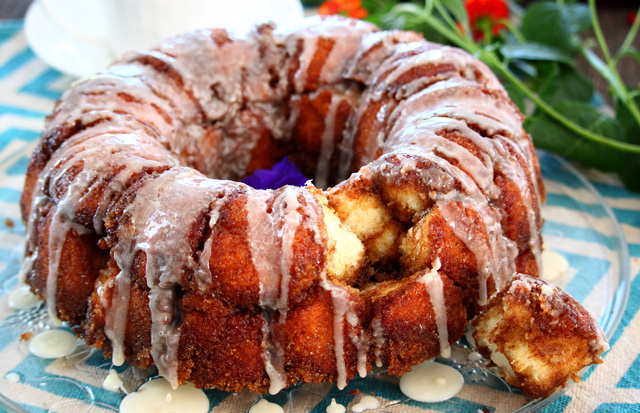 By the way, this cinnamon monkey bread recipe is made from scratch. That means I made the sweet yeast dough myself, rather than buying frozen biscuit dough as other recipes suggest. And it was all worth the extra effort. It is a soft, sweet, sticky pastry formed by combining many small balls of sweet yeast dough covered in sugar and cinnamon baked in a pan. Traditionally served at fairs and festivals but it is also perfect for breakfast, dessert, brunch, and coffee or tea time. 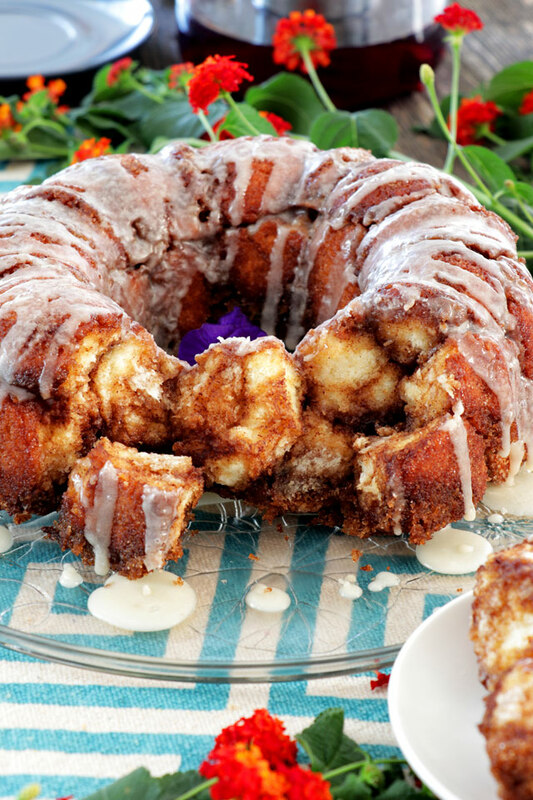 The traditional monkey bread is baked on bundt pan. Which I find is the most ideal for easier plucking. But if you do not have one, you can also use a loaf pan or muffin pan for a mini version. 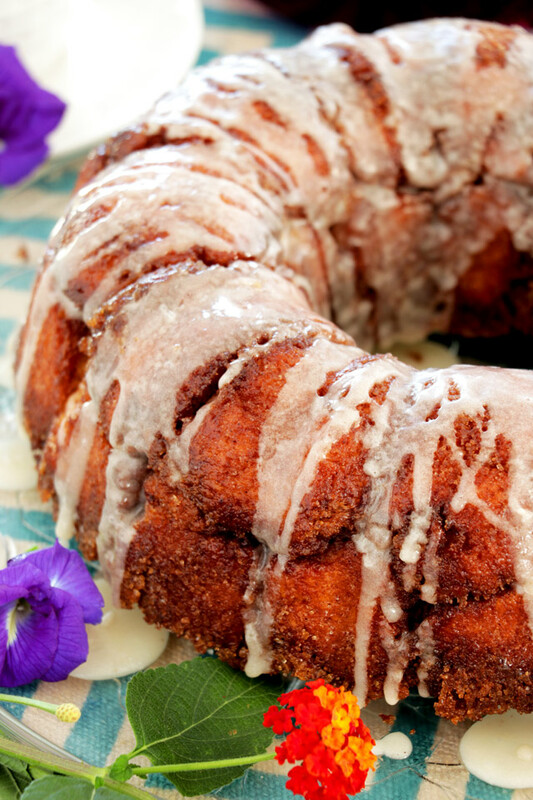 This cinnamon monkey bread recipe is fairly easy to make. The first step is to make the dough. Or you can also use store-bought frozen biscuit dough. Divide the dough into small pieces and make them into balls. Coat the balls with butter, then sugar-cinnamon mix. Place in a pan and pour the sugar-butter mixture over it and bake. I used SAF Gold instant yeast in this monkey bread recipe which is directly added to the flour and no proofing is required. It is made especially for sweet dough with its short rising time. So I didn’t have to wait that long for my dough to rise for the first time. I also skip the second rising rest time since the dough balls were already puffy by the time I was done with the rolling and coating. If you are going to use regular instant yeats or even dry active yeast, please allow some minutes for the second rising. When the coated balls are in the pan just cover the pan with plastic foil and let it rise for about 30-40 minutes. Ensaymada – A Filipino sweet bread covered with butter and sugar then topped with lots of grated cheese. Pandesal – A Filipino breakfast roll that is so simple to make. Spanish Bread – Similar to Pan de Horno but with margarine-sugar filling. 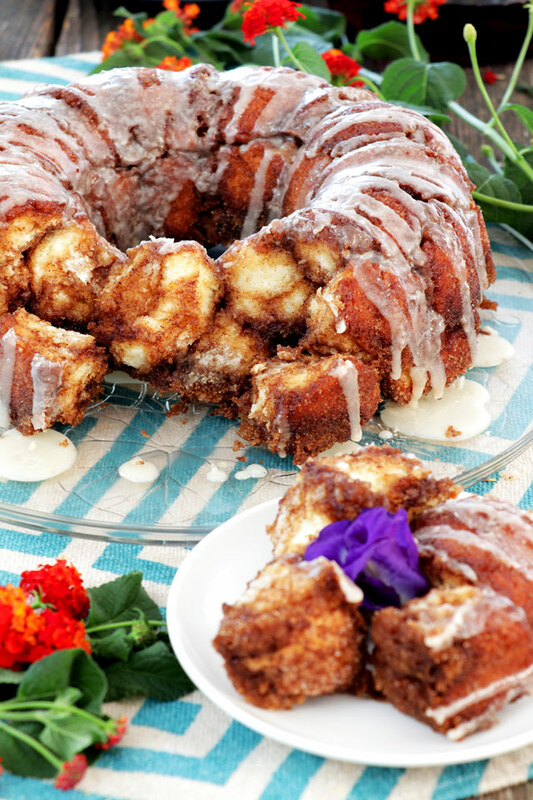 Try this homemade cinnamon monkey bread recipe for your next coffee/tea party. 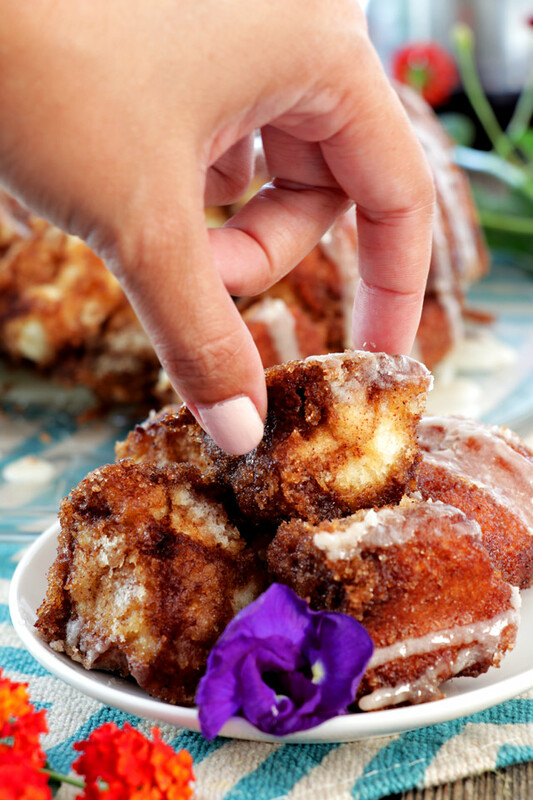 A pull apart bread with each morsel richly coated in cinnamon sugar and then drizzled with vanilla glaze all made from scratch. In a bowl, combine milk, melted butter, salt, and sugar. Mix well until sugar is dissolved. Add the eggs and whisk until well combined. Add the flour and instant yeast and mix using a spoon or your hands until it forms a firm dough. Turn dough in a floured surface and knead it for about 5 minutes or until it becomes smooth and elastic. Coat the dough with oil and place in a bowl. Cover the bowl with plastic wrap and let the dough rise for an hour or until it doubled in size. In a bowl, combine brown sugar, white sugar, and cinnamon powder. Mix together until well blended. Place butter in a separate bowl and melt in the microwave. Spray or grease a 12 cup (or 10-inch) bundt pan. Set aside. Gently punch the dough down to release air bubbles. Take a small piece of dough and roll it to a ball about 1 1/2 inch in diameter. Dip this to the butter, coating the surface completely. Next, roll it in the cinnamon-sugar mix with a generous coating. Drop each coated dough balls into the bundt pan. Make sure that they are evenly distributed around the pan. Add the remaining cinnamon-sugar mix to the melted butter plus vanilla extract and mix well. Pour this mixture over the coated balls. Bake in a preheated oven at 350F or 180C for 30 minutes or until top turns golden brown. In a small bowl, combine powdered sugar, cream and vanilla extract. Mix well until it becomes smooth. Remove bundt pan from oven and let cool for 5-10 minutes. Turn the cake out onto a serving plate and drizzle with glaze. Serve while still warm. This Monkey Bread recipe was made using instant yeast that is added directly to the flour. Active dry yeast may also be used in the same amount but should be proofed before adding to the flour. Using instant yeast also eliminated the waiting time for the second rising. The balls started to rise or puff while I was working on the rest of the balls.